"They call this day what now? Why?" "I don't care. Watch where she's putting the car keys and we're half way there, OK?" NOTES: Maya, Mira and Moonglow are part of a litter of eight beautiful Rex babies rescued after they were dumped in a park at only a few weeks of age. All eight thankfully responded well to the care they received at BHRR and are now flourishing. 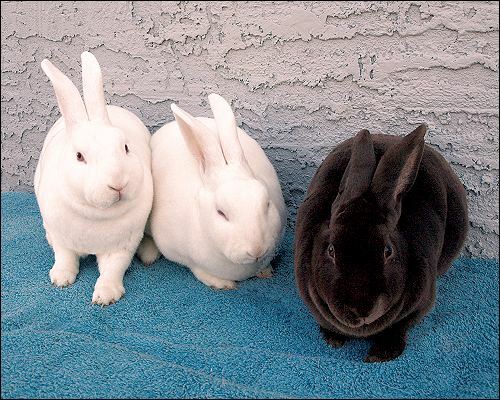 These three girls and two of their brothers (Mango and Macadamia) still reside at the shelter (three of their brothers have been adopted) where they are some of our favorite bunnies to spend time with! Mira (brown) is the “big sister” and she likes to keep her little sisters in line…but sometimes little sisters like to defy their big sisters and when that happens it’s hilarious. When the girls are being precocious they are snuggled in close and grooming, snuggling and sleeping in a perfect pile of Rex bunnies.